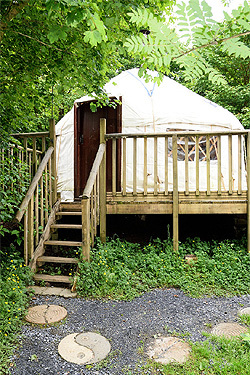 An award winning eco-friendly campsite in west Wales established in 2003. 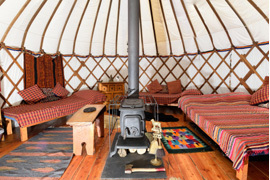 We have five different nomadic glamping tents - all are in their own 'space' with comfortable beds with wood-burning stoves, set in and around an established woodland on a 20 acre smallholding. With panoramic views, a woodland walk, wood carvings and a children's play area. Hand-made stepping stones weave in and around the campsite! All equipment is provided including extra blankets and pillows. Facilities include a communal log cabin and hot showers. A friendly service provided.